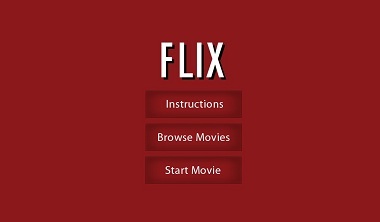 Flix is a native app that makes Netflix accessible on your BlackBerry PlayBook or BB10 device. It works by running a small invisible program on your PC and transmitting the video to your BlackBerry in real time over Wi-Fi. Flix requires a relatively high performance computer, otherwise the audio will contain popping noises and audio/video synchronization may be off. For example, my 3.5 year old laptop with an Intel Centrino doesn't appear to be up to the task. Please see this page for details on how to check whether your computer is fast enough. Flix requires between 1.5 and 10 Mbps transfer speeds between your PC and BlackBerry, depending on what quality settings you use. When you are watching a Netflix movie on your BlackBerry, the computer's audio is redirected to your BlackBerry. Given the current limitations, if you purchase this app and are in any way unsatisfied, contact me for a refund. If you need help getting this app up and running, please send me an email, since there is no way for me to respond to reviews.